Why Is My Responsive Popup Wider Than the Screen On Mobile Devices? The popup content appears wider than the screen on a mobile device even when a responsive popup size is selected. The width of the popup was set to a 'Custom' size that is greater than the width of the mobile screen. 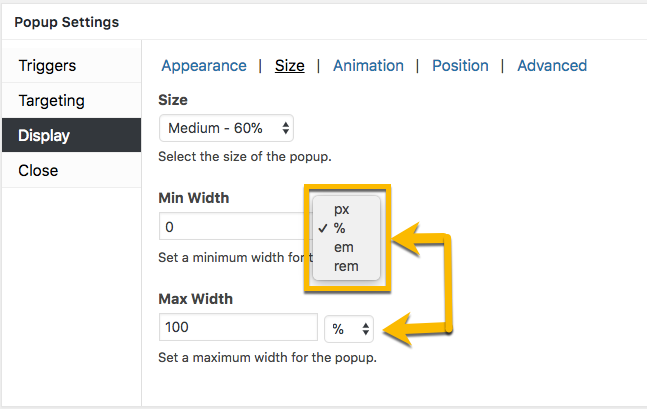 By default, the popup width is set to 640 px when the 'Custom' size is selected. to inspect the popup size setting. 2) Check the units assigned to the popup. Change the width units from pixels ( px ) to percent ( % ) to allow the popup to resize inside the screen. Review the following related article to learn about the 'Display' option settings in the Editor's Popup Settings box. 3) If the problem is not corrected by the plugin settings, the issue may be caused by the CSS applied by either your site theme or another plugin. Use your browser inspection tools to assess whether your site theme's CSS allows popup content to display wider than the device screen. See the related articles below for assistance on how to open browser inspection tools, and what to correct in your theme CSS. Can Popups Be Disabled On Mobile Devices? Why Won't My Popup Work With My Mobile Menu?